I cannot believe we've already reached the month of July and how fast this year seems to be going. I've never done a monthly favourites post before, however after regularly seeing them on Youtube and the old blogosphere I thought I'd finally give it a go; so here you have it, my favourite beauty and non-beauty items of June! 1. George Orwell's '1984': I recently finished reading this book and it has totally altered my outlook on life. I haven't read many dystopian novels so I was unsure about this one at first and it took me a little while to get into, but as soon as I did I thoroughly enjoyed it, which was definitely helped by Orwell's beautiful and eloquently written prose. I'm sure many of you will have already read this novel since it's a classic, but if you haven't I'd highly recommend it. In fact, reading as a whole has been a favourite of mine this month. Since I've now finished my exams I've been able to properly get back into it as a hobby, which I've found to be extremely satisfying and rewarding. I currently have a huge list of books I'd like to read over the summer, which you can check out by following me on Good Reads. 2. Primark's strappy sandals: To me these shoes really have a certain Alexander Wang-esque vibe about them and are a great alternative to Zara's famous strappy sandals at a small fraction of the price. Primark's version usually retail at £12, but when I took a recent visit to my local store I was delighted to find them in the sale for £6! I think they look much more expensive, and I've loved pairing them with my white Topshop Joni jeans and a pastel blue bralet, which you can find a photo of on my Instagram. Although they only had one pair left in a size too big for me I can't really complain considering their bargainous cost, plus they're super comfortable regardless. They come in numerous different colours so it's definitely worth checking them out. 3. MAC Fix+: This product is raved about in the beauty community, and although some critics claim it's nothing more than glorified water I beg to differ. I use MAC Fix+ after applying my foundation, concealer, powder and blusher to give myself an overall dewy look. It really helps my makeup to stay put throughout the day, which is essential during the hotter months when your makeup is likely to stray due to sweat. Another perk of this product is how refreshing it is to apply on a hot day as it's relatively cooling- I'll definitely be repurchasing it! 4. Ebay Beauty Blender dupe: I'd wanted to try a Beauty Blender for quite a while but didn't want to invest too much because I wasn't certain it'd be for me. I opted for a cheaper Ebay dupe (similar one here) which cost me under £2, and it's become a regular part of my morning beauty routine. It blends my foundation perfectly and leaves a seamless finish, and I'd even go as far as saying it does a better job than my Real Techniques Expert Face Brush! Although this one didn't break the bank I'm definitely considering buying an actual Beauty Blender since I've been super pleased with the results of this one. 5. Coconut body butter from The Body Shop: I've been using this product religiously after shaving or showering, as it leaves my legs feeling silky smooth and smelling like a tropical breeze, which is a scent everyone aspires to have during the summer, right? 6. 2 in 1 cleanser and toner from Nivea: Lately I've really been getting into skincare and I've made it a personal mission of mine to improve the quality of my skin, especially since I'm going to California in less than two weeks and I wont necessarily want to be wearing too much makeup in the heat. I bought this 2 in 1 cleanser and toner on a whim from Boots and it's rapidly becoming one of my holy grail items. I usually remove the vast majority of my makeup using a makeup wipe before using this product, which removes any excess and moisturises my skin, making it feel incredible afterwards. It was within the low price range so it's definitely worth picking up, especially if you're on a budget. 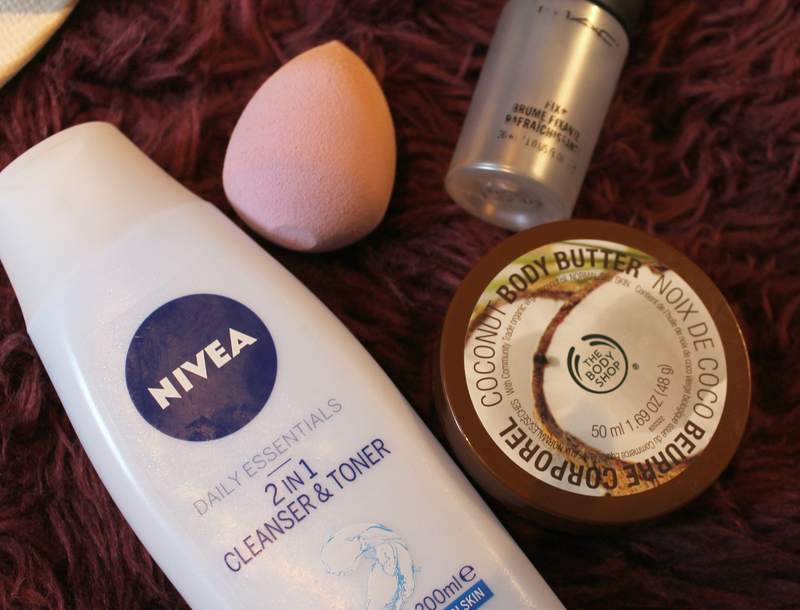 I've definitely noticed a reduction in the number of blemishes I have after using it! 7. Clinique's self sun tinted body lotion: It's no secret that my skin tone is pretty much as pale as it gets, and don't get my wrong I love being fair skinned, however during the summer when it's time to get the legs out I'm not such a fan of purple knees, so I turn to this product to give me a little glow and confidence boost. I use the lightest shade to ensure it looks totally natural, and I've found that it blends really easily and doesn't tend to look streaky, especially when applied with a mitt. Since I find it impossible to tan this item is a staple for me during the summer. Let me know if you've tried any of the products I mentioned in this post, or if you have any recommendations you think I'd enjoy! Gorgeous photographs! Those sandals are so beautiful. I just discovered your blog, and I think it's fab. Delighted I followed you. Well done! thank you for the recommendations! haven't see that particular nivea product before, def. need to look for it. those shoes look... AWESOME!! I can relate, I finally got myself to buy a beauty blender a month ago (I thought, why...?) but now I see why it is so loved lol.